The apparel retailer posted surprisingly weak second-quarter results last month. Dillard's (NYSE:DDS) stock fell by double digits last month, with losses weighing in at 11%, according to data provided by S&P Global Market Intelligence. Shareholders are down by nearly 40% in the last 12 months, which is roughly even with retailing peers such as Macy's (NYSE:M). Dillard's stock fell in response to a second-quarter earnings report that left investors wanting more. Sales, profits, and profitability levels all declined in what management admitted was a disappointing performance. "The challenges facing apparel retailers continued through the second quarter and our poor results reflect this," CEO William Dillard said in a press release. The company posted a 5% drop in comparable-store sales, or a bit worse than Macy's 3% decline. Gross profit margin fell by a full percentage point to 35% of revenue. The good news is that Dillard's remained profitable, producing $12 million in net income. Cash flow was also strong enough to fund nearly $60 million in returns to shareholders through dividends and share repurchases, which demonstrates that executives remain confident in the company's financial position. 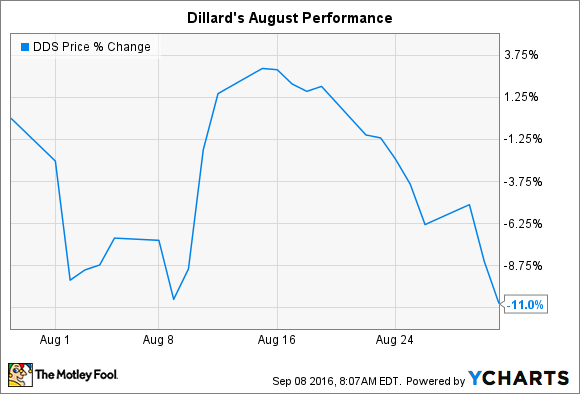 Dillard's weak customer traffic trends imply that the rest of the year will be difficult, with continued declines in comps and profits. Expense cuts should help protect bottom-line profitability, though. Meanwhile, the company is heading into the critical holiday shopping period with a fairly lean inventory position, and so it isn't likely to require aggressive promotions to get through the season. Shareholders should watch gross profit margin over the coming quarters for evidence that the retailer is holding the line on pricing. Ultimately, though, Dillard's will need to start posting comps growth that's at least as good as rivals for the stock to fully shake this bout of investor pessimism.